American taste for 18th-century French painting unfolded against a broader cultural history, explored in this chronology through political and social benchmarks, exhibitions, building projects, budding individual and institutional tastes for other facets of French art, and major museum acquisitions. The chronology also traces the dates of arrival in America, subsequent sales, and entry into museum collections for a selection of works from the exhibition and from the collection of the National Gallery of Art. This chronology is a condensed version of one that appears in the catalog of the exhibition, available through the Gallery Shops. Joseph Bonaparte arrives in New York on the American ship Commerce. He brings with him a collection of paintings including Claude Joseph Vernet’s Villa at Caprarola and Noël Nicolas Coypel’s The Abduction of Europa. Joseph Bonaparte purchases the Point Breeze estate in Bordentown, New Jersey and installs his collection. Over the years he lends works on a regular basis to American institutions including the Pennsylvania Academy of the Fine Arts, Philadelphia. Rembrandt Peale is one of many American artists to be inspired by the art from Bonaparte’s collection. The artist John Trumbull negotiates with Joseph Bonaparte a three-year loan of 17th- and 18th-century European paintings to the American Academy of the Fine Arts, New York (founded in 1802). These works are integrated into the academy’s annual exhibitions. Upon his departure back to Europe, Joseph Bonaparte gives Coypel’s The Abduction of Europa to his American friend General Thomas Cadwalader. The first of Joseph Bonaparte’s American estate sales takes place in Bordentown, New Jersey. It is organized by Thomas Birch Jr., who purchases Vernet’s Villa at Caprarola for the Pennsylvania Academy of the Fine Arts. In Boston, the French architect Jean Lemoulnier begins work on a house for Edward Preble Deacon and his wife, Sarah Annabella Parker Deacon, which will be decorated in a French style. Over the next few years, the Deacons make purchases of French paintings in Paris. The Deacon House interiors are completed this year. The house includes an exact reproduction of Marie-Antoinette’s boudoir, with furniture upholstered in pink satin, fittings in Sèvres porcelain, and paintings by Jean Honoré Fragonard and François Boucher. Joseph Bonaparte’s Point Breeze, which was purchased by Henry Beckett, British consul in Philadelphia, is demolished. In the Atlantic Monthly, French émigré Élie Reclus discusses Edmond and Jules de Goncourt, journalists, diarists, and prolific historians of 18th-century art, inaugurating a growing awareness of the brothers’ contribution to a revival of interest in the era. William Kissam and Alva Vanderbilt begin the construction of their house at 660 Fifth Avenue working with architect Richard Morris Hunt and the Parisian interior decorating firm Jules Allard et Fils. Known as the “Petit Château,” this edifice is modeled on a Loire Valley château and features a Louis XV white-and-gold drawing room. Hubert Robert’s The Octavian Gate and Fish Market enters the Vassar College Art Gallery (now the Frances Lehman Loeb Art Center), Poughkeepsie, New York, a bequest of Henderson Green of New York. To inaugurate their Petit Château at 660 Fifth Avenue, William Kissam and Alva Vanderbilt organize a costume ball for 1,200 guests. Some guests come dressed as French royalty, including dozens of Louis XVIs. Jules Allard et Fils establishes a branch in New York and will produce many salons and ballrooms in an 18th-century style for clients such as Cornelius Vanderbilt II. There seems to be no abatement in the rage for drawing-rooms in the style of the three monarchs who last sat upon the French throne during the three quarters of a century just preceding the great Revolution. Alva Vanderbilt purchases Boucher’s The Toilette of Venus from C. J. Wertheimer, London. Cornelia Bradley-Martin organizes a lavish costume ball, transforming the interior of the Waldorf Hotel into a replica of Versailles. The Exposition Universelle opens in Paris. Andrew Mellon and the Carnegies are among 26 collectors who travel from Pittsburgh to Paris for the occasion. Nathan Wildenstein, Ernest-Nathan Gimpel, and his son René Gimpel open a branch gallery in New York at 250 Fifth Avenue near Madison Square Park called E. Gimpel and Wildenstein. Specializing in 18th-century French art, they follow other European firms branching into the New York market. James Hazen Hyde organizes a ball for 600 guests at Sherry’s Restaurant on 44th Street and Fifth Avenue, New York. The theme is the Court of Versailles, with decorations that evoke the gardens of Versailles. Georges Hoentschel sells a collection of some 2,000 pieces of 18th-century French decorative art to J. Pierpont Morgan, who immediately presents this collection to the Metropolitan Museum of Art, New York. The museum creates a department of decorative arts. Fragonard’s Study for the Pursuit Panel is auctioned in Paris. Fragonard’s The Fountain of Love, from a private collection in England, is sold to Henry Reinhardt and Sons, New York, by Thomas Agnew and Sons, Ltd., London. By about 1915, it will be in the collection of John North Willys in Toledo, Ohio. Louisine Waldron Elder, later Mrs. Henry Osborne Havemeyer, purchases Portrait of a Young Woman in White from E. Gimpel and Wildenstein, New York. The work (now considered Circle of Jacques Louis David) will be acquired in 1930 by Chester Dale and given to the National Gallery of Art, Washington, in 1963. Henry Clay Frick purchases Fragonard’s ensemble of paintings known as The Progress of Love while the panels are still on display at the Metropolitan Museum of Art in the blockbuster Loan Exhibition of the J. Pierpont Morgan Collection. William Kissam Vanderbilt gives Boucher’s The Toilette of Venus to the Metropolitan Museum of Art. Wildenstein and Co., Inc., New York, acquires Jean-Baptiste Greuze’s The Drunken Cobbler. Helen Clay Frick, daughter of Henry, founds the Frick Art Reference Library, New York, and hires French librarian and art historian Clotilde Brière to source scholarly material for the new institution. Helen Clay Frick purchases Fragonard’s Study for the Pursuit Panel from Wildenstein and Co., Inc., New York. Wildenstein and Co., Inc., New York, sells Greuze’s The Drunken Cobbler to Joseph R. Bowles of Portland, Oregon. John D. Rockefeller Jr. makes a major financial donation ensuring the preservation of the buildings, fountains, and gardens of Versailles and Fontainebleau and the roof of the Rheims cathedral. The Wadsworth Atheneum, Hartford, inaugurates a two-week exhibition, French Art of the Eighteenth Century, drawing on the collections of New York dealers and collectors. The paintings are interspersed with French decorative arts, including a Louis XVI paneled boudoir. William R. Timken, New York, acquires Boucher’s The Love Letter from Wildenstein and Co., Inc., New York. His widow, Lillian Guyer Timken, gives the painting to the National Gallery of Art, Washington, in 1960. Chester Dale purchases Boucher’s The Bath of Venus at the sale of Grace Elvina Hinds Duggan Curzon, Marchioness of Curzon, at Anderson Galleries, New York. Kay Kimbell and his wife, Velma, of Fort Worth, purchase the first known 18th-century French painting to arrive in Texas, by Élisabeth Louise Vigée Le Brun. French Painting and Sculpture of the XVIII Century opens at the Metropolitan Museum of Art. Boucher’s The Toilette of Venus is presented. Probably in this year, Edmund Arthur Ball purchases François Hubert Drouais’s Marquise de Caumont La Force. David David-Weill consigns David’s Portrait of Jacques François Desmaisons, Fragonard’s The Useless Resistance (La Résistance inutile), and Nicolas Lancret’s Luncheon Party in a Park (Le Déjeuner de jambon) to Wildenstein and Co., Inc., New York. Nine new galleries of French art open at the Philadelphia Museum of Art. David-Weill Collection Pictures opens at Wildenstein and Co., Inc., New York. Eleanore Elkins Widener Rice bequeaths her collection of 18th-century French furniture and decorative arts to the Philadelphia Museum of Art. Mr. and Mrs. E. John Magnin, New York, purchase Fragonard’s The Useless Resistance (La Résistance inutile) from Wildenstein and Co., Inc., New York. David and Ingres: Paintings and Drawings opens at M. Knoedler and Company, New York. David’s Portrait of Jacques François Desmaisons is presented. Mrs. Emilie L. Heine, Cincinnati, who has purchased Vigée Le Brun’s Portrait of a Young Woman Playing a Lyre from Knoedler and Company, New York, gives it with a life interest to the Cincinnati Art Museum. Chester Dale gives Boucher’s The Bath of Venus to the National Gallery of Art, Washington. The French Revolution: A Loan Exhibition for the Benefit of the Société d’Histoire de la Révolution Française opens at Wildenstein and Co., Inc., New York. Among the works exhibited is David’s Portrait of Jacques François Desmaisons from Wildenstein’s stock. The Albright Art Gallery (now the Albright-Knox Art Gallery), Buffalo, New York, acquires David’s Portrait of Jacques François Desmaisons from Wildenstein and Co., Inc., New York. The Jacques Helft Gallery, New York, sells Lancret’s Luncheon Party in a Park to Forsyth Wickes, who in the previous decades has assembled one of the finest collections of 18th-century art in America (much of it donated to the Museum of Fine Arts, Boston). Confiscated by the Nazis during World War II, The Young Artist, attributed to Joseph Siffred Duplessis, and Carle Van Loo’s Sculpture are restituted to Clarice von Rothschild, who is living in New York City. Wildenstein and Co., Inc., New York, purchases Jean-François de Troy’s Before the Ball from Morton Lee, Esq., London. Rosenberg and Stiebel, New York, purchases Fragonard’s Blind Man’s Buff from Clarice von Rothschild. Baroness Valentine Noémi von Springer, née Rothschild, Vienna, sells Vigée Le Brun’s Self-Portrait to Newhouse Galleries, Inc., New York. It is acquired by Kay and Velma Kimbell. The Young Artist, attributed to Duplessis, is given to the Virginia Museum of Fine Arts, Richmond, by Mrs. Adolph D. Williams. The Heine Collection—including Vigée Le Brun’s Portrait of a Young Woman Playing a Lyre— enters the Cincinnati Art Museum. Rosenberg and Stiebel, New York, acquires Van Loo’s Sculpture from Clarice von Rothschild. The Fine Arts Museums of San Francisco acquire Van Loo’s Sculpture from Rosenberg and Stiebel, New York. Director John Maxon purchases Joseph Ducreux’s Le Discret for the University of Kansas Museum of Art (later the Spencer Museum of Art), Lawrence, Kansas. Beneficence Continues: Paintings from the E. Arthur Ball Collection opens at the Ball State Teachers College Art Gallery (now the David Owsley Museum of Art) in Muncie, Indiana. Drouais’s Marquise de Caumont La Force is exhibited. Charles E. Dunlap, Saint Louis, purchases Boucher’s Jeanne Antoinette Poisson, Marquise de Pompadour from Rosenberg and Stiebel, New York. The Samuel H. Kress Foundation, New York, purchases Louis-Joseph Le Lorrain’s Three Figures Dressed for a Masquerade from the New York branch of the David M. Koetser Gallery. The Toledo Museum of Art acquires Fragonard’s Blind Man’s Buff as a gift of Edward Drummond Libbey. 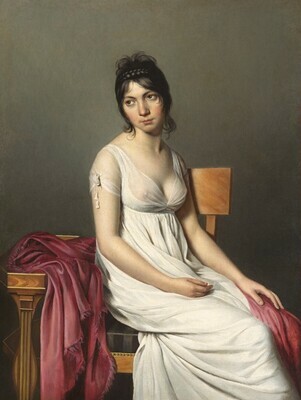 The Worcester Museum of Art, Massachusetts, purchases Guillaume Lethière’s Girl with Portfolio. French Eighteenth-Century Painters opens at Wildenstein and Co., Inc., New York. David’s Portrait of Jacques François Desmaisons and Lancret’s Portrait of the Actor Grandval are presented. French Painting from David to Rouault opens at the Atlanta Art Association Galleries. Lethière’s Girl with Portfolio is shown. The Dutch government deaccessions Drouais’s Children of the Marquis de Béthune Playing with a Dog to Rosenberg and Stiebel, New York. The Century of Mozart opens at the William Rockhill Nelson Gallery of Art (now the Nelson-Atkins Museum of Art), Kansas City, Missouri. Boucher’s The Toilette of Venus and David’s Portrait of Jacques François Desmaisons are presented. Profiles and Perspectives in 19th-Century French Art opens at the Spencer Museum of Art. Jean-Louis Laneuville’s Portrait of Pierre Charles Ruamps, lent by Jacques Seligmann and Co., New York, is shown. Mrs. William W. (Marion Bowles) Hollis donates Greuze’s The Drunken Cobbler to the Portland Art Museum, Oregon. The Virginia Museum of Fine Arts acquires Van Loo’s A Pasha Having His Mistress’s Portrait Painted. The Age of Elegance, the Rococo, and Its Effect opens at the Baltimore Museum of Art. The exhibition combines painting and sculpture with furniture, silver, porcelain, ormolu, and tapestries, primarily from France and Italy. Coypel’s The Abduction of Europa is presented. The Joslyn Art Museum, Omaha, purchases Laneuville’s Portrait of Pierre Charles Ruamps from Jacques Seligmann and Co., New York. Mr. and Mrs. Herman C. Krannert of Indianapolis purchase Boucher’s Idyllic Landscape with Woman Fishing from Rosenberg and Stiebel, New York. This same year, they purchase Lancret’s Portrait of the Actor Grandval from Wildenstein and Co., Inc., New York. On November 7, they give both paintings, under the terms of a life agreement, to the John Herron Institute (now the Indianapolis Museum of Art). Following John F. Kennedy’s inauguration as president, Jacqueline Kennedy meets with David Finley, chairman of the US Commission of Fine Arts (and the first director of the National Gallery of Art), and establishes the Fine Arts Committee for the White House. Georges Wildenstein gives to the White House a drawing by Fragonard, The Apotheosis of Franklin, c. 1778, the first major art acquisition made during the Kennedy administration. (Fragonard’s sister-in-law and pupil Marguerite Gérard made an engraving of the drawing titled To the Genius of Franklin). Wildenstein and Co., Inc., New York, purchases Drouais’s Portrait of Carlos Fernando FitzJames-Stuart, Marquess of Jamaica (as Madame du Barry Playing the Guitar) at the sale of the Dowager Vicountess Harcourt at Christie’s London. Jean-Baptiste Oudry’s A Young Rabbit and Partridge Hung by the Feet is in the collection of Mr. and Mrs. André Meyer by this year. The painting is shown in the Exhibition of the Collection of Mr. and Mrs. André Meyer, which opens on June 9 at the National Gallery of Art, Washington. Wildenstein and Co., Inc., New York, sells Drouais’s Children of the Marquis de Béthune Playing with a Dog to Eugenia Woodward Hitt. The Cleveland Museum of Art acquires Jean Bernard Restout’s Sleep. Mr. and Mrs. E. John Magnin give Fragonard’s The Useless Resistance (La Résistance inutile) to the de Young Museum, San Francisco, although it remains in their possession until 1975. Kay Kimbell leaves his estate to the Kimbell Art Foundation on his death, thereby creating a permanent art institution for Fort Worth, Texas. Forsyth Wickes gives Lancret’s Luncheon Party in a Park to the Museum of Fine Arts, Boston. Vigée Le Brun’s Self-Portrait is given to the Kimbell Art Foundation as part of the Kimbell estate. Charles E. Dunlap gives Boucher’s Jeanne Antoinette Poisson, Marquise de Pompadour to the Fogg Museum, Harvard University, Cambridge, Massachusetts. Helen Clay Frick purchases Van Loo’s The Arts in Supplication from the Heim Gallery, London, and places the painting on temporary loan with the Frick Collection, New York. The World of Voltaire opens at the University of Michigan Museum of Art, Ann Arbor. Van Loo’s A Pasha Having His Mistress’s Portrait Painted is shown. Helen Clay Frick gifts Van Loo’s The Arts in Supplication to the Frick Art & Historical Center, Pittsburgh. Nicolas de Largillierre’s portraits of Marguerite de Sève and Barthélemy Jean Claude Pupil are acquired by the Putnam Foundation for the Timken Museum of Art, San Diego. The H. Shickman Gallery, New York, purchases Louis Léopold Boilly’s The Electric Spark at the Hôtel Drouot, Paris. The Virginia Museum of Fine Arts acquires this painting from the H. Shickman Gallery, New York, the following year. Helen Clay Frick gives Fragonard’s Study for the Pursuit Panel to the Frick Art & Historical Center, Pittsburgh. Eugenia Woodward Hitt purchases Portrait of Carlos Fernando FitzJames-Stuart, Marquess of Jamaica (as Madame du Barry Playing the Guitar) from Wildenstein and Co., Inc., New York. French Painting 1774–1830: The Age of Revolution opens at the Detroit Institute of Arts. Greuze’s The Drunken Cobbler is one of the works presented. Ambassador Walter H. and Leonore Annenberg purchase Anne Rosalie Bocquet Filleul’s Portrait of Benjamin Franklin from Wildenstein and Co., Inc., New York, which had acquired the work from the family of the artist. The Age of Louis XV: French Painting, 1710–1774 opens at the Toledo Museum of Art. Among the works presented are Coypel’s The Abduction of Europa, Fragonard’s Blind Man’s Buff, and Restout’s Sleep. The New Orleans Museum of Art acquires Greuze’s Portrait of Marie Angélique Vérany de Varennes, Mme Georges Gougenot de Croissy. The Eye of Thomas Jefferson opens at the National Gallery of Art, Washington. David’s Portrait of Jacques François Desmaisons is presented. The Philadelphia Museum of Art purchases Vernet’s Villa at Caprarola from the Pennsylvania Academy of the Fine Arts. Paris–New York: A Continuing Romance opens at Wildenstein and Co., Inc., New York. Coypel’s The Abduction of Europa, Vernet’s Villa at Caprarola, Boucher’s The Toilette of Venus, David’s Portrait of Jacques François Desmaisons, Drouais’s Marquise de Caumont La Force, and Lancret’s Portrait of the Actor Grandval are shown. Boucher’s Earth: Vertumnus and Pomona is sold by Élie de Rothschild, France, to David Carritt and his consortium of art dealers, Artemis. The Philadelphia Museum of Art acquires Coypel’s The Abduction of Europa. The Cleveland Museum of Art acquires Boucher’s Fountain of Venus from P. and D. Colnaghi, London. 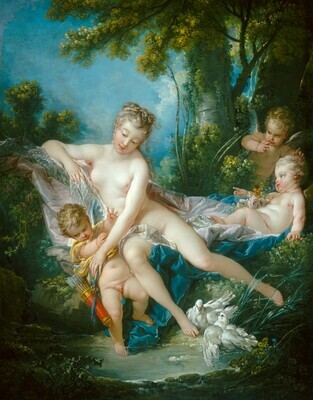 The Columbus Museum of Art acquires Boucher’s Earth: Vertumnus and Pomona. The H. Shickman Gallery, New York, purchases Oudry’s A Young Rabbit and Partridge Hung by the Feet at the sale of André and Bella Meyer’s collection held at Sotheby’s New York. Didier Aaron, Inc., New York, purchases Charles Joseph Natoire’s Bacchanal at Christie’s London. The Allen Memorial Art Museum, Oberlin College, Ohio, acquires Oudry’s A Young Rabbit and Partridge Hung by the Feet from the H. Shickman Gallery, New York. Alice Speed gives Adélaïde Labille-Guiard’s Portrait of Madame Adélaïde to the Speed Art Museum, Louisville, Kentucky. The North Carolina Museum of Art, Raleigh, purchases Pierre Jacques Volaire’s The Eruption of Mt. Vesuvius from Agnew’s, London. Élisabeth Louise Vigée Le Brun, 1755–1842 opens at the Kimbell Art Museum. Self-Portrait is presented. The Kimbell Art Foundation purchases Jean Siméon Chardin’s Young Student Drawing from Noortman and Brod, New York. The Rococo Age: French Masterpieces of the Eighteenth Century opens at the High Museum of Art, Atlanta. Boucher’s Earth: Vertumnus and Pomona and Idyllic Landscape with Woman Fishing; Greuze’s Portrait of Marie Angélique Vérany de Varennes, Mme Georges Gougenot de Croissy; and David’s Portrait of Jacques François Desmaisons are presented. The Museum of Fine Arts, Houston, purchases Natoire’s Bacchanal from Didier Aaron, Inc., New York. The J. Paul Getty Museum, Los Angeles, purchases de Troy’s Before the Ball from Wildenstein and Co., Inc., New York. Watteau, 1686–1721 opens at the National Gallery of Art, Washington. The Kimbell Art Museum purchases Greuze’s La Simplicité (Simplicity) from French and Company, Inc., New York. François Boucher, 1703–1770 opens at the Metropolitan Museum of Art. Among the works featured are Earth: Vertumnus and Pomona, The Toilette of Venus, and Idyllic Landscape with Woman Fishing. Colnaghi, New York, purchases Lancret’s The Amorous Turk at Christie’s London. Fragonard opens at the Metropolitan Museum of Art. Blind Man’s Buff is presented. The Sarah Campbell Blaffer Foundation, Houston, purchases Lancret’s The Amorous Turk from Colnaghi, New York. Colnaghi, New York, purchases Pierre Peyron’s The Death of Alcestis at Sotheby’s Monaco. The Winds of Revolution: A Loan Exhibition for the Benefit of the French Institute/Alliance Française opens at Wildenstein and Co., Inc., New York. Laneuville’s Portrait of Pierre Charles Ruamps is shown. The Sarah Campbell Blaffer Foundation purchases François de Troy’s Self-Portrait at auction at Sotheby’s Monaco. Eugenia Woodward Hitt leaves Drouais’s Children of the Marquis de Béthune Playing with a Dog and Portrait of Carlos Fernando FitzJames-Stuart, Marquess of Jamaica (as Madame du Barry Playing the Guitar) to the Birmingham Museum of Art, Alabama. The North Carolina Museum of Art purchases Peyron’s The Death of Alcestis from Colnaghi, New York. The Dallas Museum of Art acquires Jean-Antoine Théodore Giroust’s Oedipus at Colonus. Didier Aaron, Inc., New York, purchases Natoire’s The Rest by a Fountain at Christie’s Monaco. Bob Haboldt and Co., Inc., New York, purchases Marie Victoire Lemoine’s Portrait of a Youth in an Embroidered Vest at the Hôtel Drouot, Paris. Bob Haboldt and Co., Inc., sells the painting to the Cummer Museum of Art (now the Cummer Museum of Art & Gardens), Jacksonville, Florida, the following year. The Ball Brothers Foundation gives Drouais’s Marquise de Caumont La Force to the Ball State Teachers College Art Gallery (now the David Owsley Museum of Art, Ball State University). Didier Aaron, Inc., New York, sells Natoire’s The Rest by a Fountain to the Hood Museum of Art, Dartmouth College, Hanover, New Hampshire. Intimate Encounters: Love and Domesticity in Eighteenth-Century France opens at the Hood Museum of Art, Dartmouth College. Among the works presented are Natoire’s The Rest by a Fountain; Fragonard’s Blind Man’s Buff; Greuze’s Simplicity and The Drunken Cobbler; and Boilly’s The Electric Spark. 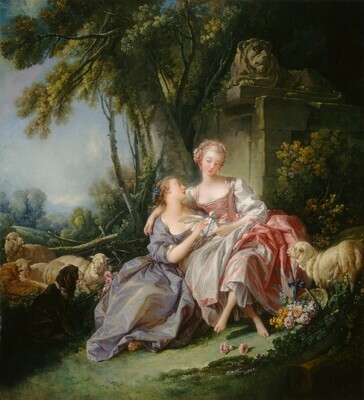 The J. Paul Getty Museum purchases Fragonard’s The Fountain of Love from Simon Dickinson. The painting had appeared at auction at Christie’s New York on January 29 from the collection of Mr. Wilson C. Lucom and Mrs. Virginia Lucom (née Willys). The Age of Watteau, Chardin, and Fragonard: Masterpieces of French Genre Painting begins its run at the National Gallery of Art, Washington. Lancret’s Luncheon Party in a Park; de Troy’s Before the Ball; Chardin’s Young Student Drawing; Van Loo’s A Pasha Having His Mistress’s Portrait Painted; Greuze’s Simplicity; Fragonard’s Blind Man’s Buff; Louis Rolland Trinquesse’s An Interior with a Lady, Her Maid, and a Gentleman from the Maurice Segoura Collection; and Boilly’s The Electric Spark are shown. 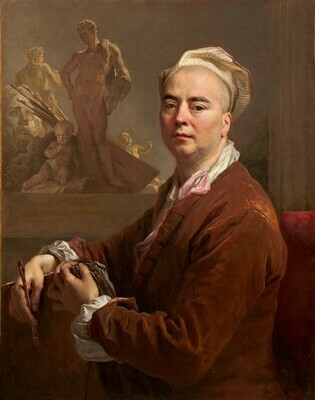 Largillierre’s Self-Portrait is sold by the descendants of comte Alexandre-Marie de Boisgelin, Paris and Château de Beaumont, Beaumont-le-Roger (Eure), at Christie’s Paris, where it is purchased by Wildenstein and Co., Inc., New York. The French Portrait: Revolution to Restoration opens at the Smith College Museum of Art, Northampton, Massachusetts. The exhibition explores the scope of French portraiture in the neoclassical era (1784–1826). Ducreux’s Le Discret and Lethière’s Girl with Portfolio are shown. The National Gallery of Art, Washington, acquires Largillierre’s Self-Portrait from Wildenstein and Co., Inc., New York. The Wadsworth Atheneum acquires Trinquesse’s An Interior with a Lady, Her Maid, and a Gentleman at Maurice Segoura’s estate sale (Christie’s New York). Ambassador Walter H. and Leonore Annenberg give Filleul’s Portrait of Benjamin Franklin to the Philadelphia Museum of Art. Adam Williams acquires Adèle Romany’s Portrait of Auguste Vestris, which had appeared at auction at Sotheby's London on July 5, 2007, from a private collection in England. He sells the painting to the Museum of Art, Rhode Island School of Design, Providence, the following year. La Volupté du Goût: French Painting in the Age of Madame de Pompadour opens at the Portland Art Museum, Oregon, and includes Van Loo’s Sculpture and The Arts in Supplication. Paris: Life and Luxury opens at the J. Paul Getty Museum. The exhibition evokes the splendor of life in Paris in the mid-18th century and includes Coypel’s The Abduction of Europa, Natoire’s Bacchanal, and de Troy’s Before the Ball. Louis Style: French Frames, 1610–1792 opens at the J. Paul Getty Museum. De Troy’s Before the Ball is shown. Vigée Le Brun: Woman Artist in Revolutionary France is on view at the Metropolitan Museum of Art. The Artist’s Brother and Self-Portrait are shown. Hubert Robert, 1733–1808 opens at the National Gallery of Art, Washington. America Collects Eighteenth-Century French Painting is on view in the National Gallery of Art's West Building, May 21–August 20, 2017.